You crave for French food. You want to eat it all. And you want to investigate first-hand if French food deserves the credit it receives. But you are also on a Vegetarian or Gluten-Free diet. Then welcome to the Great Food Sampling in Montmartre! How is that possible? Simply, French foods are so diverse they always offer some diet-responsible choices. This tour presents 3 food choices at every stop: vegetarian, gluten-free, and other. Gluten-free cake or pastry? Easy! A vegetarian choice at the pâté store? Same! We stop at a cheesemonger, a rôtisseur, an Auvergne cheese & ham store, a bakery, a pastry store, a seafood store, and vegetable and fruit stands. Then we sit down for lunch at the terrace of a Parisian café. At every stop, we sample foods we like, right there and then. We also buy more food, ahead of the proper sit-down meal we share at the end. Our itinerary makes its way up Montmartre’s rue Lepic – one of Paris’ most celebrated food streets. The family-run stores we have selected support responsible family farming. Most of them are organic. And each of them provides succulent food selections. For all fellow travelers, this tour also offers non-vegetarian/GFD food alternatives. Vegetarians, Gluten-Free Diets and other eaters: we are proud that our tour is open to everyone. Please note that our menu is for lacto-ovo-vegetarians. It includes cheese and dairy products. We may be unable to address food restrictions besides GFD and Vegetarian. And our point? We ought to all eat together. Diet eaters should not be cast aside. Their travel companions too should have the time of their lives. And what’s more congenial and friendly than to share a meal together?! This tour generates inspiring conversations about dietary choices. Guests understand each other a lot better after our tour. And French food gets an all-thumbs up! Our Paris Food Tour runs rain or shine, on Thursdays at 10am and on Saturdays at 4:30pm. It lasts a comfortable 2.5 hours. Closed on Dec. 24 & 25 only. The tour ends near Sacré Coeur and metro Anvers (line 2). For samples of your favorite French foods, and of French foods you don’t know yet. And for the people you’ll meet along the way. Our Paris Food tour is €89/adult (or US$110) discounted to €60 (US$74) for kids 17 and under. Simply inform your guide of your food preferences at the start of your tour. Vegetarians, Gluten-Free Diets, and us all “meat eaters”, we all walk and eat together. This tour welcomes Gluten-Free and Vegetarian eaters, with choices available at each stop. Other food restrictions may not be available. For GFD with high intolerance, please note that while products we buy are gluten-free, the stores do not have gluten-free kitchen labs, and particles of foods contain small quantities of gluten may fall in. Not recommended for wheelchairs, because of cobblestone and a climb. 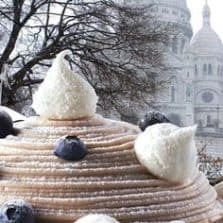 The Paris Food tour ends near Sacré Coeur and metro Anvers (line 2).